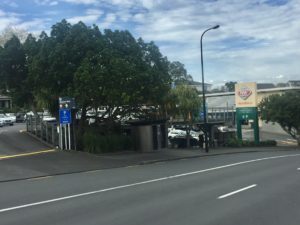 Clonbern Upper Carpark Closed Again – Remuera Residents Association Inc. This is to advise that the top level of the Clonbern Road carpark in Remuera will be closed from Sunday 24 March at 6pm. As you may be aware, following concerns about the structural integrity of the carpark, it was temporarily closed last year. The top deck was reopened In January with a weight restriction (no vehicles over 2.0 tonnes). Auckland Transport has sign posted this restriction and had staff on site to monitor the size of vehicles entering the top level. Since reopening the top level in early January, there has been an average of 10 overweight vehicles using the top level at any one time. However, it has been difficult to monitor this on an ongoing basis, hence the decision to close it. We stress that there are no safety concerns relating to the 129 spaces on the ground level. We thank you for patience and apologise for any inconvenience. What do you as a Remuera resident think of collecting tolls on the State Highway Motorways in Auckland?